KIEV, Ukraine -- One of the most challenging tasks faced by journalists writing on international affairs is to compare and contrast language used by neo-Soviet authoritarians and western diplomats with reality on the ground. 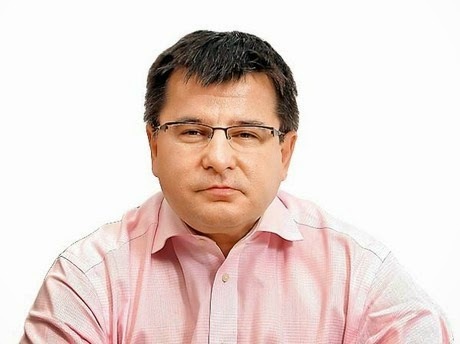 Taras Kuzio, author of this article, is a research associate at the Centre for Political and Regional Studies, Canadian Institute for Ukrainian Studies, University of Alberta and non-resident fellow at the Center for Transatlantic Relations, School of Advanced International Relations, Johns Hopkins University. Foremost is the Orwellian doublespeak habitually used by neo-Soviet leaders such as Russia’s Present Vladimir Putin and Ukraine’s ex-President Viktor Yanukovych. Testifying before the US Senate’s Foreign Relations Committee, for example, Secretary of State John Kerry said Russian officials had repeatedly lied to him and other western leaders over their country’s intervention in eastern Ukraine. This is at a time when the numbers of dead and wounded soldiers returning to Russia are rising. Major offensives by separatists (Ilovaysk, August 2014, Donetsk Airport, January, Debaltseve, February) require large numbers of Russian troops brought from as far away as the Mongolian border, as a wounded Buryat tank driver revealed to Russian independent newspaper Novaya Gazeta. Such doublespeak is augmented by what could be described as diplomatic obfuscation, a language that only those operating in the Byzantine diplomatic profession can fathom. Diplomatic obfuscation describes a world at odds with the reality on the round witnessed by journalists. Speaking before the US House Committee on Foreign Affairs, Assistant Secretary of State Victoria Nuland was asked if Russia’s intervention was tantamount to an invasion, to which she replied in the affirmative. Nevertheless, Kerry and Nuland did not themselves mention Russian deception or use the word “invasion” in their prepared testimonies. An even more revealing case of diplomatic obfuscation is playing up the success of the Minsk II ceasefire, despite the following 10 reasons to see it as a failure. 1. There are 12,000 Russian troops in Eastern Ukraine according to US Army Europe Commander Ben Hodges and there are no signs of a withdrawal. 2. Russia sent its eighteenth “humanitarian” convoy, often used to smuggle troops and arms, into Ukraine last week. All of the convoys are undertaken without Kiev’s official permission. 3. Russia refuses to allow Ukraine to regain control over its border facilitating the continued flow of Russian nationalist volunteers. In authoritarian Russia, where the FSB secret police are omnipresent, nationalist volunteers are permitted to openly recruit, raise funds, train and travel to eastern Ukraine. 4. Separatist leaders have openly stated their intentions of capturing the entire Donbas region and towards this goal advancing on the port of Mariupol and Kharkiv. According to a leaked Russian presidential document, Kharkiv was always the primary objective in spring of last year – not Donetsk – and, as a PBS documentary showed, the city faced fierce running battles between pro-Ukrainian and pro-Russian forces that were won by Kiev only in May. Large numbers of drones illegally fly over Mariupol operated by Russian forces. The Swedish government thinks likewise. 5. Russia continues to train terrorists who have undertaken deadly attacks in Kharkiv. An attack on Luhansk was thwarted and the terrorist admitted to being trained by Russian military intelligence officers (GRU) “Aleksei” and “Dmitrovich”. 6. Ukrainian nationalists continue to undertake attacks behind separatist lines, including one over the weekend against Luhansk separatist officer Aleksei Mozgovoi. 7. Ignoring numerous international appeals, Russia continues to illegally imprison Ukrainian pilot Nadiya Savchenko. The 33-year old Savchenko was persuaded to end an 83-day hunger strike and has become “a symbol of resistance to Russia in her home country”. 8. Proposals for Ukraine to drop its goals of NATO and EU membership by copying Austrian neutrality after World War II are another example of diplomatic obfuscation that clouds major differences between the cases. Neutral Austria had a democratic political system whose elections were not directed by the Soviet Union and its sovereignty was never questioned. In contrast, Putin seeks regime change and the overthrow of Ukraine’s democracy, installation of a pro-Russian leader and authoritarian political system. How is the EU’s support for Russian-style neutrality today consistent with its respect for European values and recognition of Ukraine as a sovereign state, especially when Putin’s satrap of choice could be Yanukovych, who is wanted for major financial crimes and murder by Interpol? 9. Russia continues to illegally occupy Crimea and is planning to build a large military base that will reportedly host nuclear weapons. 10. Western diplomats are not as confident in private as they are in public at the success of the Minsk II ceasefire. According to Doug Saunders of Canada’s Globe and Mail, they have begun to quietly discuss the “Kosovo option”; that is, undertaking air strikes against eastern Ukrainian separatist targets. Garten-Ash succinctly summarises what needs to be done – “in 14 words: Putin must withdraw his forces and Ukraine have full control of its eastern frontier”. In the meantime, while Russian deception continues to spar with western diplomatic obfuscation, others will continue to try and fathom what each side is really saying.